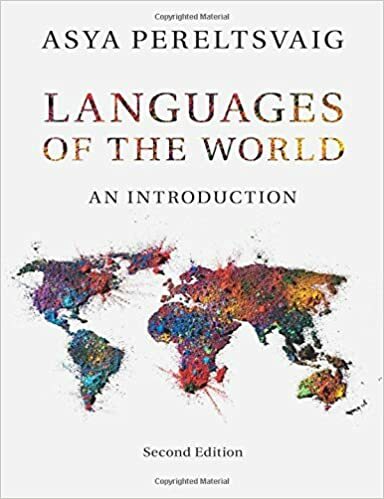 In 1929, anthropologist and linguist Edward Sapir wrote: “Few people realize that within the confines of the United States there is spoken today a far greater variety of languages … than in the whole of Europe. We may go further. We may say, quite literally and safely, that in the state of California alone there are greater and more numerous linguistic extremes than can be illustrated in all the length and breadth of Europe”. Today, it is safe to narrow down Sapir’s observation even further to Northern California or even just San Francisco Bay area, one of the most linguistically diverse areas in the United States. 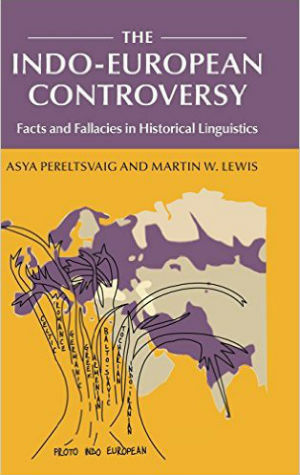 And while Sapir was only thinking of indigenous Native American languages, we will examine linguistic diversity in terms of “heritage languages”, an umbrella term for both immigrant languages and those of Native Americans. According to the latest statistics, 181 immigrant languages are spoken in the U.S. today, with an alphabetical list runing from Adamawa Fulfulde, a Niger-Congo language spoken in Cameroon, to Zoogocho Zapotec, an Oto-Manguean indigenous to Mexico. The list of Native American languages totals 175, although most are spoken by increasingly small communities. Today’s post focuses on immigrant languages, and a separate GeoCurrents post will be dedicated to California’s Native American languages. 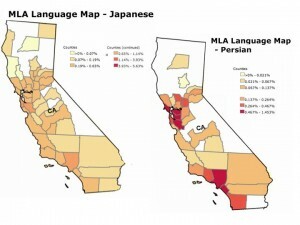 As can be seen from the map on the left, California has the largest heritage language communities in the United States. 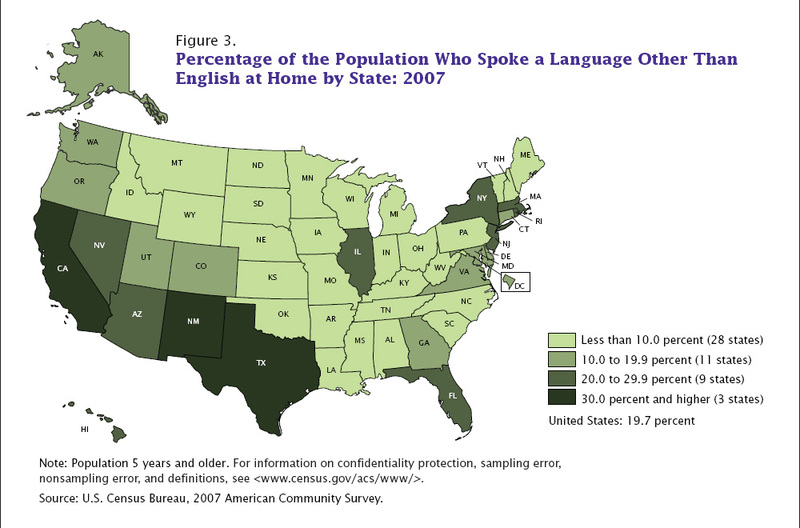 43% of people in California – over 14 million people – reported speaking a language other than English at home in 2007. New Mexico and Texas trail with 36% and 34% respectively. Other states with high proportions of non-English-speakers include New York and Arizona (29% in both), New Jersey (28%), Nevada (27%), Florida and Hawaii (26% in both). In absolute numbers, Texas, New York, and New Jersey together have about as many heritage language speakers as California alone. 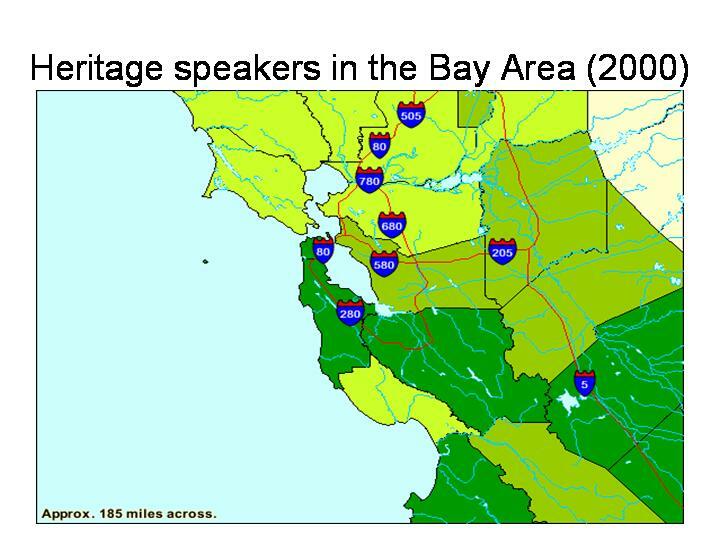 Another pattern in both California and the U.S. as a whole is the concentration of heritage speakers in urban counties, especially those that serve as immigrant gateways,. This is the case for Atlanta, Chicago, Miami, and New York City. 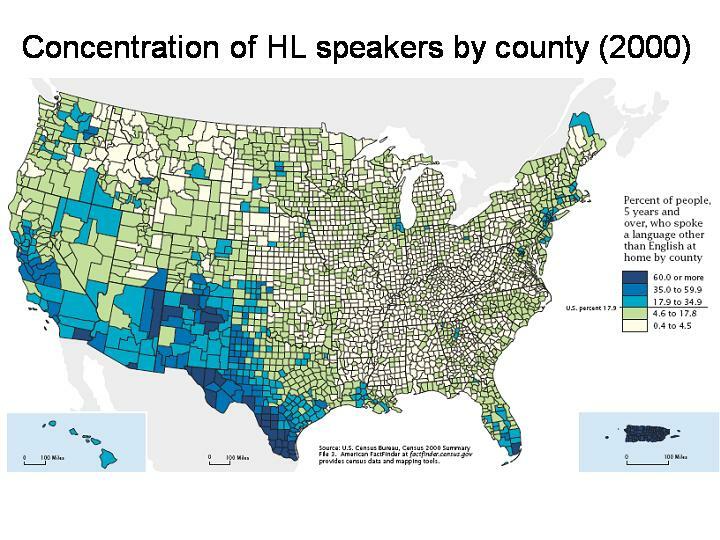 In California, Los Angeles County has the second largest concentration of heritage speakers in the state – 54%, whereas San Francisco county registers 46%. 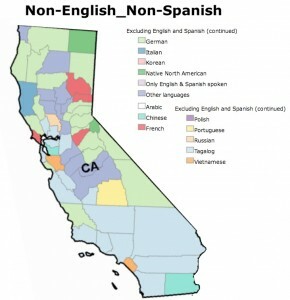 Unlike Alaska, Arizona, New Mexico, and Utah, California has relatively few speakers of Native American languages. While the two California counties with the largest heritage language communities – Imperial and Los Angeles – are in the south, Northern California also figures prominently in this regard. 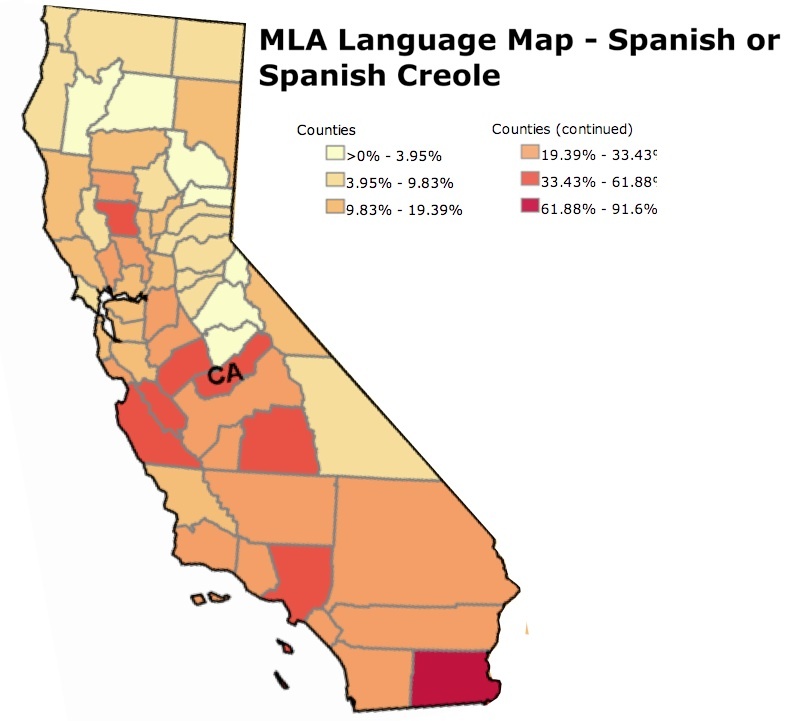 More than 40% of the population in Monterey, San Francisco, Santa Clara, Merced, Tulare, San Mateo, Colusa, and Fresno counties speak a language other than English at home. But sheer numbers or percentages of heritage speakers is only one way to assess linguistic diversity. 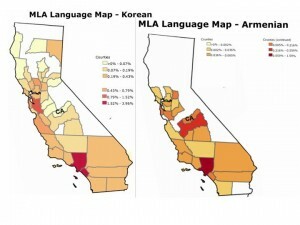 As it so happens, Northern California, and especially the area stretching from San Francisco to San Jose, boasts a very different kind of linguistic diversity. In most counties with large numbers of heritage speakers, Spanish predominates. In Imperial, Los Angeles, and Monterey counties, for example, the proportion of non-English/non-Spanish speakers is under 8%. In contrast, the largest non-English/non-Spanish-speaking communities are found in what we might call Greater Silicon Valley, or the San Francisco-San Jose corridor: San Francisco county 33%; Santa Clara county 28%; and San Mateo county 23%. Alameda country, in the East Bay comes in the fourth at 22%. Many heritage speakers here are highly educated workers and students drawn to the high-tech job mecca of Silicon Valley. This situation is distinctive from that found in most other parts of the state, and the U.S. as a whole, where a high percentage of “non-English at home” families generally correlates with lower income levels. In California’s agricultural counties, many Spanish speakers are relatively poor farm workers. What specific heritage languages are spoken in California? As can be seen from the chart below, Spanish is found in two out of three non-English-speaking households. 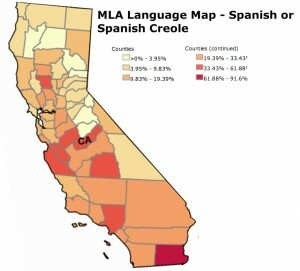 In all California counties, Spanish is the second most widespread language after English. * Many fewer people, less than 5% of heritage speakers, use the third most popular language in the state, Tagalog, the Austronesian language from the Philippines. 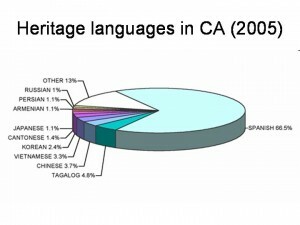 ** As can be seen from the map on the left, Tagalog is the third most common language in most counties in Southern California and many in Northern California. 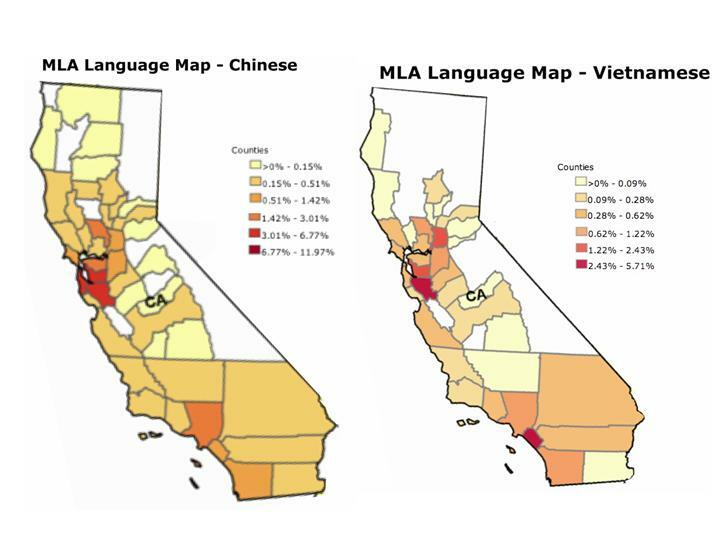 Next on the list of home languages in California is “Chinese”, an umbrella term for a number of different languages that are not mutually understandable in their spoken form: Mandarin, Cantonese, Taiwanese, and so on. However, all the data presented here come from the U.S. census, in which respondents are asked “what language other than English do you speak at home?”. In principle, anything can be written in the 16-letter response box (the 2000 census states, “For example: Korean, Italian, Spanish, Vietnamese”). Some respondents write “Cantonese” or “Mandarin”, the two most widespread Chinese languages in the U.S., while others simply put down “Chinese”. 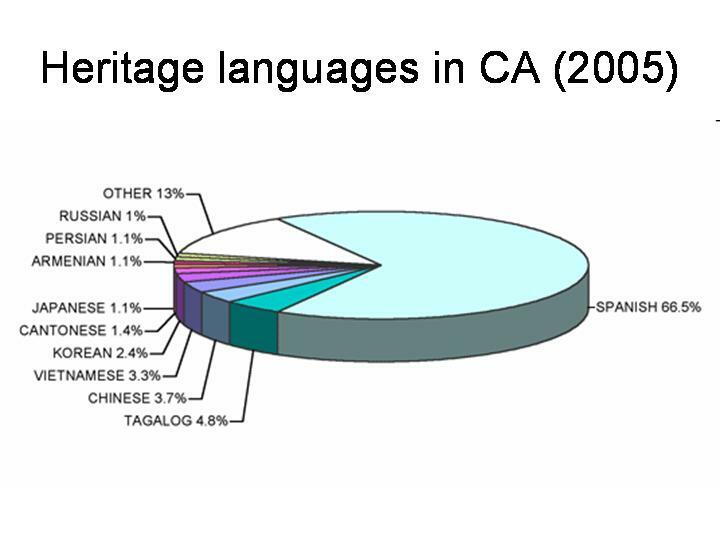 The responses are tabulated separately, such that (undefined) “Chinese” is spoken by 3.7% of California’s heritage speakers, while an additional 1.4% speak Cantonese (Mandarin doesn’t make it into the top ten list). 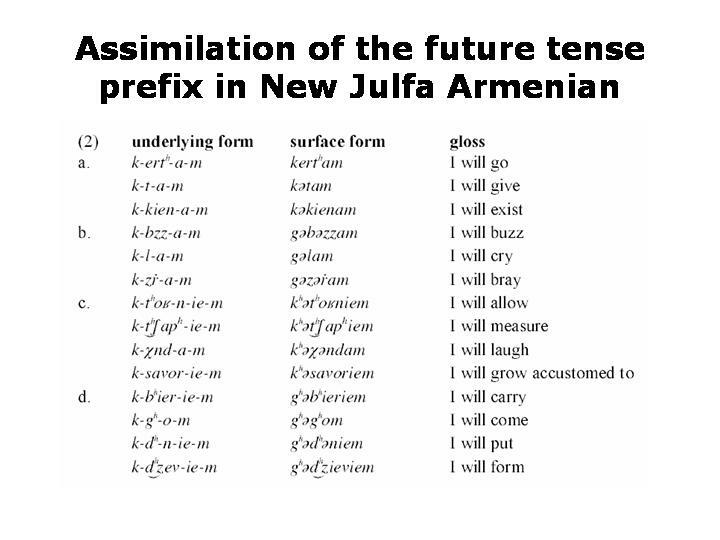 Other entries in the California list include three East Asian languages: Vietnamese, Korean, Japanese; and three Indo-European languages: Armenian, Persian and Russian. As can be expected, heritage languages are not distributed uniformly over the state. Unsurprisingly, the largest Spanish-speaking communities are found along the border and in the agricultural counties of the San Joaquin Valley (especially Merced, Madera, and Tulare counties). Spanish-speakers are also concentrated in Monterey and San Benito counties, known for their labor-intensive vegetable crops (such as artichokes in Castroville and lettuce in the Salinas Valley); and in agricultural Colusa county in the Sacramento Valley,. Unlike Spanish speakers, those of Asian languages – Chinese, Vietnamese, Korean, Japanese – live mostly in urban and suburban areas in both Northern and Southern California. 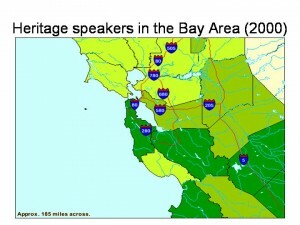 Speakers of Chinese (here, subsuming Cantonese and Mandarin) live mostly in the Bay Area, especially in San Francisco, Alameda, San Mateo, and Santa Clara counties. In Alameda county Chinese is the third most common language, whereas in San Francisco Chinese (including Cantonese and Mandarin) is the second most common language after English (surprisingly this is also true in regard to Imperial county on the Mexican border, but there it is due to the even smaller numbers of speakers of other languages). 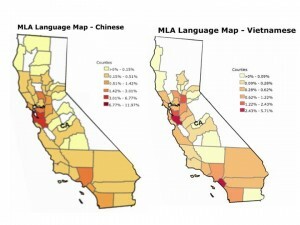 In both Santa Clara county in Northern California and Orange county in Southern California, Vietnamese is the third most commonly spoken language after English and Spanish. Orange county and Los Angeles county are home to large Korean communities. The largest Armenian communities are found in Los Angeles county, especially, in the city of Glendale, which has dozens of authentic Armenian eateries. The much smaller Armenian community of Fresno county, however, is perhaps better known, due to the works of the writer William Saroyan. 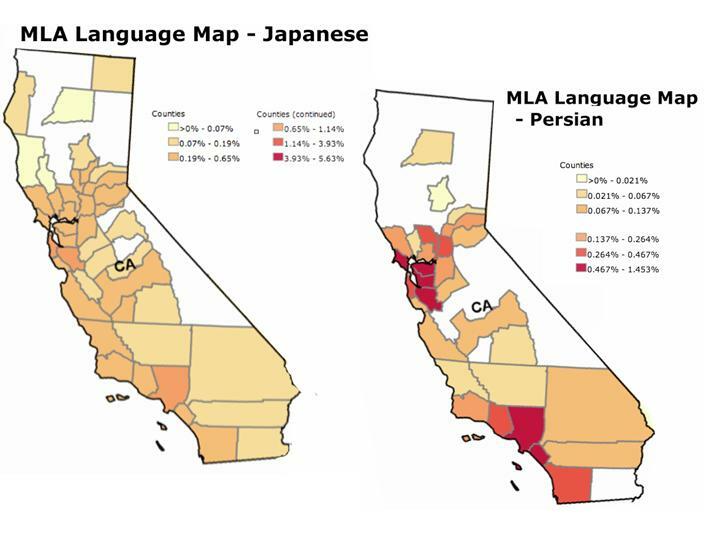 As can be seen from the map on the left, Japanese and Persian speakers live mostly in the urban and suburban areas around San Francisco and Los Angeles. The Persian concentration in the wealthy areas of “West LA” is especially notable. 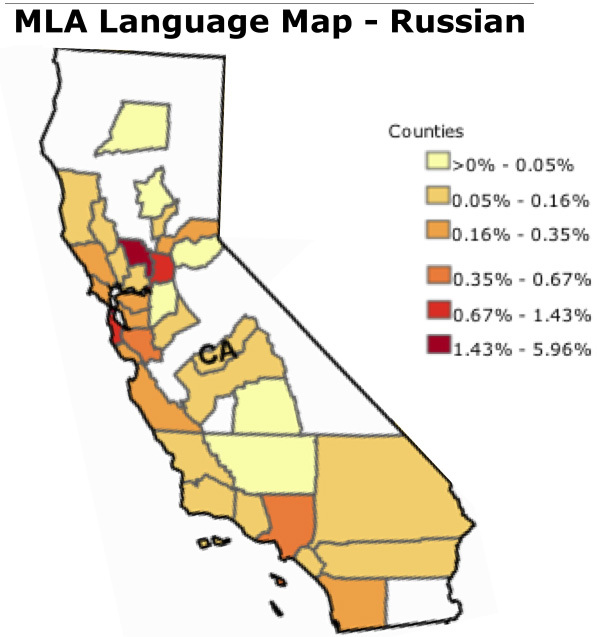 Unlike Persian and Armenian speakers, Russian speakers have a clear preference for Northern California, with the highest concentrations in San Francisco and Yolo counties. According to the 2000 census, more than 16,000 Russian speakers call San Francisco, “The City by the Bay,” home. The clustering of Russians in largely agricultural, tomato-growing Yolo county, with 2,740 speakers (2000), or 1.75% of the county’s population, is associated with the attraction of the University of California, Davis. Yolo is the only county in California, and one of only a handful in the country, where Russian constitutes the third most common language after English and Spanish. 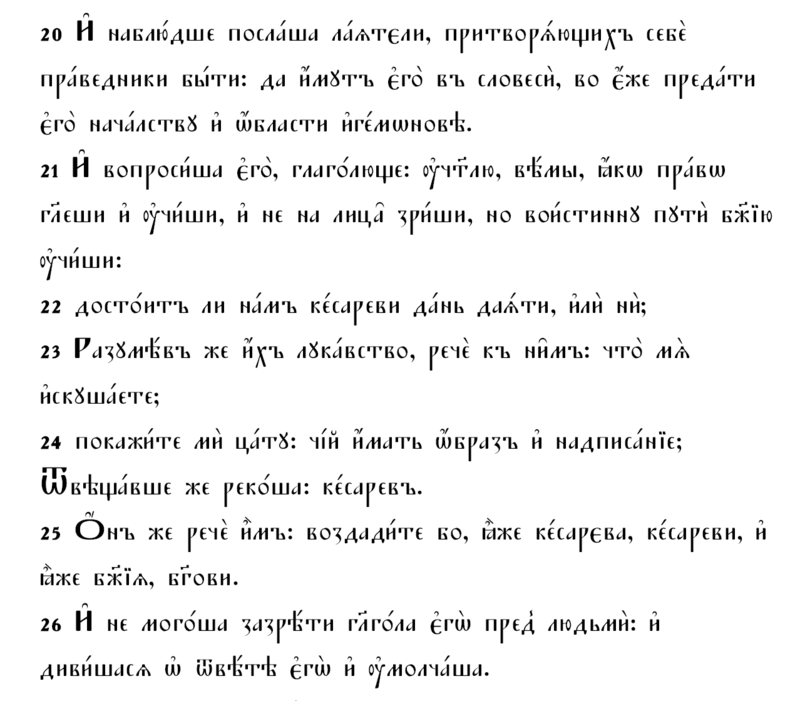 In addition to the top ten heritage languages, dozens of others can be heard in the San Francisco Bay Area, including European languages such as German, Dutch, French, Italian, Portuguese, Swedish, Danish, Norwegian, Polish, Serbian, Croatian, Czech, Greek, Irish Gaelic, and Hungarian (the latter is the only non-member of the Indo-European language family); South Asian languages, both Indo-European, like Hindi, Gujarati, Panjabi, Urdu, and Marathi, and Dravidian, like Tamil, Telugu, and Kannada; languages of East and Southeast Asia, such as Thai, Khmer, Laotian, Burmese, Hmong, and languages from the Miao-Mien family; Austronesian languages including Samoan, Indonesian, Chamorro and Tongan; Semitic languages such as Arabic, Hebrew, Amharic, and Syriac; and African languages such as Kru, Ibo, and Yoruba. 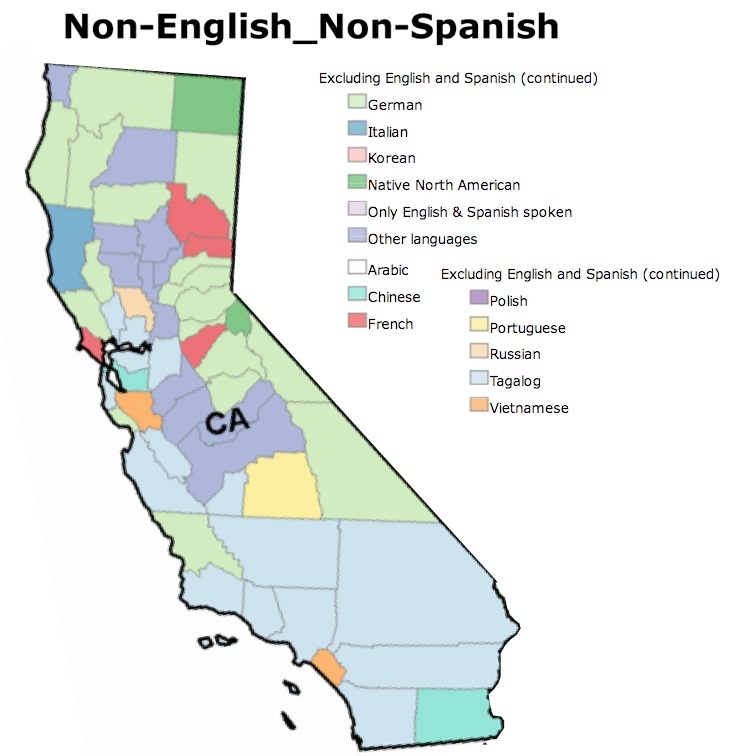 While this high degree of linguistic diversity may seem like a purely academic matter, it presents a real challenge for San Francisco Bay Area teachers and students, especially in Santa Clara county, where nearly half of all households – 49.6% – reported that they “sometimes or always spoke a language other than English at home”, according to the 2010 U.S. census. According to the Palo Alto Unified School District’s Home Language Survey conducted in September 2011, fully one-third of its 12,300 public school students speak a language other than English at home. 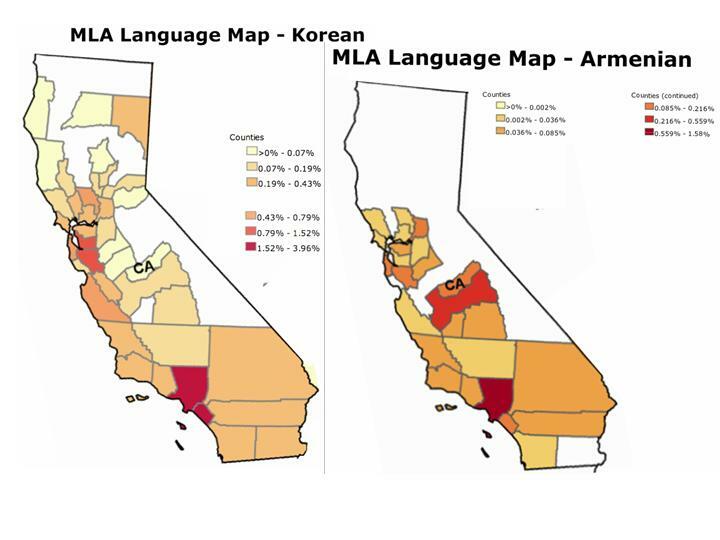 This trend is more pronounced in the southern end of town, where at Barron Park, Hoover, and Juana Briones elementary schools more than 45% of children specify their home language as something other than English, In the neighboring Los Altos School District, the figure is 30.4% . 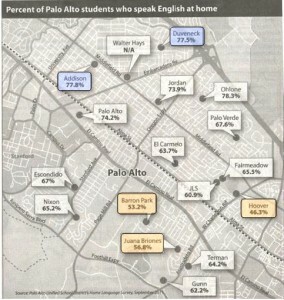 The most commonly spoken heritage language in Palo Alto schools is Chinese, followed by Spanish, Korean, Hebrew, and Russian, but other languages, including, Laotian, Arabic, Armenian, Persian, Turkish, Hungarian, and Tongan are spoken as well. 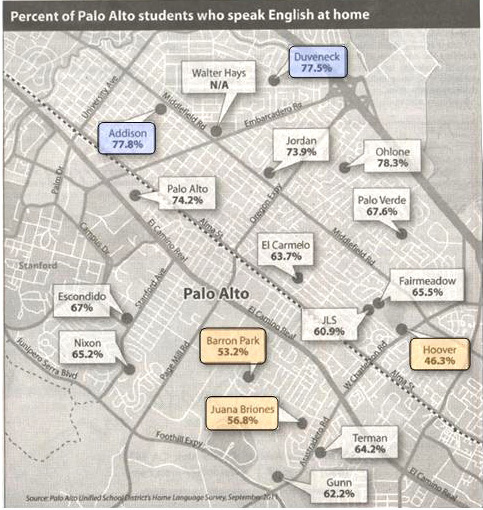 The proportion of heritage-speaking students in Palo Alto has increased by 8% in the last decade and is predicted to continue to grow. Palo Alto – located in the shadow of Stanford University – has long attracted international scholars and graduate students, and their children mostly attend local public schools. More recently, the rise of cosmopolitan Silicon Valley, has drawn students speaking such languages as Gujarati, Hebrew, and Russian. The internet has contributed to the global reach of Palo Alto schools in another way as well. Public schools here have acquired a global reputation for academic excellence through on-line sources, attracting some eager parents. Education consultants in Asia help spread the word about Palo Alto’s scholastic reputation. Yet another factor involves outreach programs for students with special needs. One publicized case concerned a Mexican student who had been injured by a truck while playing street soccer at home. He arrived at Gunn High School in Palo Alto in a wheelchair some years ago, and was able to graduate from the program. Palo Alto schools are famous for their outstanding educational programs, their cultural and linguistic diversity, and their social acceptance of students from a wide array of backgrounds. But the downside is also clear. Palo Alto High School (“Paly”) and Gunn High School are also noted for their high levels of academic pressure, which can be overwhelming. Three years ago, Gunn High School made national news after four of its students committed suicide by stepping in front of speeding trains. * In San Francisco county, however, Spanish places third, if figures for “Chinese”, “Cantonese”, and “Mandarin” are tabulated together. ** Tagalog is spoken natively by about a quarter of the population of the Philippines. Its standardized form, known as Filipino, serves as the national language of the Philippines, alongside English.